MALAGA, Spain, Mar 10 2014 (IPS) - “Who will speak for them now? 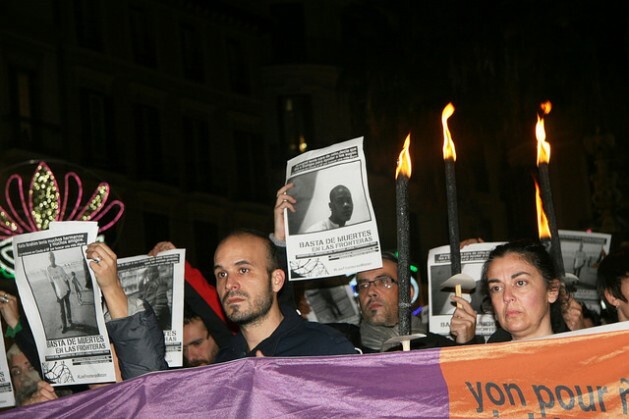 Who will tell their stories to their families in Cameroon or Ivory Coast?” asked Edmund Okeke, a Nigerian, about the 15 migrants who died while trying to swim to the shore of the Spanish city of Ceuta from Morocco. The victims were driven back with rubber bullets fired by the Spanish Guardia Civil (militarised police) from the beach of this Spanish enclave in north Africa, on Feb. 6. “These are people living in unbearable conditions of poverty and who are seeking a better life. Why else would they want to leave their country and embark on such a long and dangerous journey?” said Okeke, the president of the Palma-Palmilla Immigrants Association in the southern Spanish city of Malaga. The 15 migrants drowned when dozens jumped into the sea to try to reach Ceuta by swimming around the breakwater separating Moroccan and Spanish waters. The Interior minister, Jorge Fernández Díaz, admitted on Feb. 13 when he appeared before parliament that the authorities had fired rubber bullets and tear gas from the land to the water. “But not at the people,” he emphasised in his description of the facts being investigated by the attorney general’s office, following a complaint lodged by a score of non-governmental organisations. Fernández Díaz visited Ceuta and Melilla, the other autonomous Spanish city in northern Africa, on Mar. 5 and 6. There he announced that the fences separating the enclaves from Morocco would be reinforced with special wire mesh to make them even harder for immigrants to scale. Every year thousands of Africans, mostly from the sub-Saharan region, try to get into the European Union by climbing the three rows of fences lined with razor wire that separate Moroccan territory from Ceuta and Melilla, or by crossing the border in small boats from Morocco or their home countries. But swimming across was an even more desperate option. Tina Adrasubi, a 34-year-old Nigerian, left her home in Benin 13 years ago to come to Spain in order to help her family. “I went to Mali by car with a friend, and then on foot to Morocco to cross to Ceuta,” she told IPS, rocking her two-month-old daughter, Gloria. Many sub-Saharan Africans take years to reach Morocco. Each of the young men who drowned has his own story, and perhaps a mother who is waiting for a phone call that never comes, but “it seems that does not matter at all when you are poor,” complained Okeke to IPS. The five bodies recovered on the Spanish side of the border fence lie in anonymous graves in a Ceutan graveyard. The others were taken to Moroccan morgues. The governing People’s Party rejected a move in Congress to open a commission of enquiry into the tragedy. Cecilia Malmström, European Commissioner for Home Affairs, suggested in a letter to minister Fernández Díaz that “the rubber bullets could have provoked panic among the group of immigrants” attempting to swim ashore, contributing to the deaths. Some 80,000 immigrants, 40,000 in Morocco and another 40,000 in Mauritania, are waiting their chance to enter the EU through Ceuta and Melilla, the minister said on Mar. 4, according to figures provided by Morocco and corroborated by his office. In 2013, a total of about 100,000 immigrants were intercepted trying to cross maritime and land borders into the 28 member countries of the EU. Spain is the fourth most frequent route of irregular entry, according to the December 2013 figures from the European Agency for the Management of External Borders (Frontex), quoted by its assistant director, Gil Arias. “Instead of rescuing them, they were treated like animals,” Christiana Nwokeji, the president of the Malaga Union of Nigerian Women, complained to IPS in her home. While she was talking, a video on the television showed several survivors who managed to swim to shore in Ceuta, only to be immediately sent back to Morocco. Nwokeji remarked that Spaniards, too, are emigrating because of the extremely high unemployment rate, due to the economic crisis and the new regulations that make it easier to fire workers. “Everyone in the world emigrates when they face a lack of opportunities,” she said. “I was born in a crisis. We have always lived in crises,” Gora Ndiaye, a 28-year-old Senegalese man, told IPS. He said he felt “very afraid and very cold” in the small boat in which he and 45 of his fellow countrymen spent a week, travelling from Dakar to the Spanish municipality of Hoya Fría on Tenerife, one of the Canary Islands. “The nights were terrible. The waves were like mountains. I felt stabbing pains in my arms and legs,” said Ndiaye, who cannot swim, and who paid about 500 euros (693 dollars) for the crossing in a flimsy boat. “I am lucky to have lived to tell the tale,” he said. According to Balance Migratorio en la Frontera Sur de 2013” (Migration Balance on the Southern Border 2013), a report presented in February by the Andalusian Human Rights Association (APDHA), 7,550 immigrants were intercepted reaching Spain by boat or through Ceuta and Melilla. The number of people who died or disappeared in the attempt were 130 in 2013. The study reported that 45.25 percent of African immigrants, over half of them from sub-Saharan Africa, arrived in boats and 27.4 percent on inflatable rafts. Some 15.75 percent scaled the fences at Ceuta and Melilla. On Feb. 28, 200 immigrants climbed the fences at Melilla and their celebration of their arrival with hugs and laughter was shown on television. Yvette Edere, from Ivory Coast, told IPS she felt “very sad” about what happened in Ceuta, and said she “had to struggle very hard” to get legal residence in Spain, where she arrived with a visa 20 years ago. “Many white people from Europe and the United States come to Africa,” said Okeke. He is presently helping some Spaniards who want to go to work in Nigeria. “They exploit its gold and its oil, and no one fires on them. There are no barriers or documents required. They are treated like kings,” he concluded. This is quite sad. I am Nigerian and I do feel that some of my country men and women who raise so much money to emigrate to Europe or the Middle-East and so on, would have been better off if they had invested that money into something worthwhile in Nigeria. But, they have their reasons for leaving and I cannot really speak for them. SSA leaders need to get their acts together so that our people can stop running to foreign lands for a so-called better life.